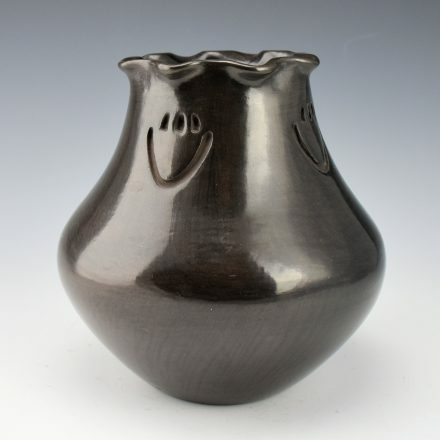 Judy and Lincoln Tafoya (1954-2005) worked together for twenty years making pottery. Lincoln learned to make pottery from his sister-in-law Sharon Naranjo Garcia. He was a son o Dan Tafoya and Billie Rose Lee. Judy is a daughter of Cecilia Naranjo and learned to make pottery from her grandmother Christina Naranjo. Judy began making pottery in 1982 and married Lincoln in 1984. This water jar has a fluted rim and four bear paws. The jar is stone polished and fired a brown coloration. It is signed on the bottom in the clay, “Judy and Lincoln Tafoya”. It is in excellent condition with no chips, cracks, restoration or repair.